Care homes have suffered a lot of bad press nationally. There are however some important exceptions, where 'Care' really does mean 'what it says on the tin', and a star example of this is the Norfolk Christian residential care home, Eckling Grange, at Dereham. Here is a place where the care is frankly second to none. The senior management is made up of committed Christians who are well qualified, experienced and highly professional. The atmosphere in the home is excellent. In the vast majority of conversations had with individual residents, it has been a matter of a few seconds before they talk about how thrilled they are with the care they receive. The care staff go about their work efficiently and unobtrusively. The care really does come across as genuine. 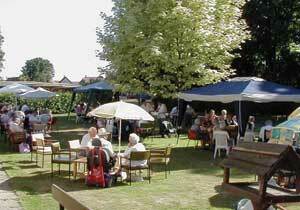 Eckling Grange is set in beautiful, well maintained grounds on the outskirts of Dereham. In the home itself there are 60 rooms covering various levels of care, including the recent introduction of an EMI (Elderly Mentally Infirm) unit. There is also a very good range of communal facilities, including dining rooms, large lounges, patio areas and extensive gardens. Also, grouped in a horseshoe around a lawn with mature, shady trees, are 58 bungalows for retired people who can be as independent as they wish, but in reach of care as needed. There is a good community spirit, helped by the range of regular organised activities. These are too numerous to mention, but they go from physical and mental stimulation activities in the EMI unit, to mid-week Bible study groups. This is an ideal retirement situation for those who have been accustomed to attending church on Sundays and being involved in home groups as these all happen 'in-house'. All the activities are open to both residents of the home and the bungalows, and it is this easy mix of the 'fitter' bungalow residents with the more physically restricted residents of the home, which contributes to the happy, mutually supportive caring Christian atmosphere so clearly evident at Eckling Grange. Relatives and friends are invited to social occasions such as Mothering Sunday social afternoon, Strawberry Tea, Harvest Festival, Guy Fawkes night, Father Christmas etc, etc. Eckling Grange will obviously suit committed Christians down to the ground, but of course it is open to anyone; none of the services or other overtly Christian activities are compulsory. It is a wonderful, caring Christian community which couldn't be further from the picture painted all too often in the press. Pictured above is tea time at Eckling Grange.